After almost a year, I've already got my prize for my baby, instead of a week supply, they gave us a month supply. Wow! Thanks a lot! The prize came so late, the Mommy Academy Club page where I joined photo contest was no more active. Thanks God, I found out that Sweet Baby Diaper has already a page in Facebook. I asked them about my concern, good thing they immediately respond to the matter. When they told me about what I'm going to have, I'm so happy. My expenses will be lessen. But sad to say, I need to pick-up the prize. At first, I don't know when I will get the chance to go and pick up the prize, at the same time I don't know who will in favor of getting it if I am not able to go there. Expected that the prize is heavy, no one will agree with me. So I let the time passed by, knowing and feeling positive that I will get it in God's time. So that's it, I am still the one responsible to pick-up the diapers. Thanks God for the ways, the reasons, HOPE and BIG BLESSING. I got one of my prayers and that's to work with my friend at Manila. That's the way I am talking about, I left at work early and drop by at Sweet Baby's office, all by my self. I told myself, just be strong and have faith that you will get there safe and you will be home safe. I really don't know how to go to that place, I just asked the directions to the guards, police or traffic aids that I encountered that time. I'm so nervous and afraid I might get lost. The heavy prize was worth it to carry all by myself, the long walk made me so tired and got muscle pain. 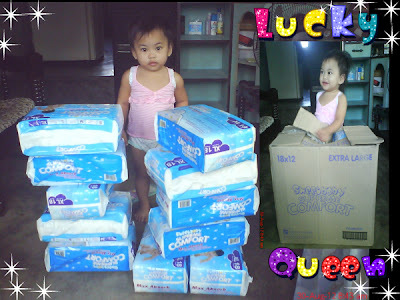 I gave one pack to her cousin Pauline, so the photo has 11 packs only.I am not so greedy, I'm happy to share some of them to my relatives. But as much as possible, we'll keep it for Queen, in case I can't buy because of financial matters. My deepest gratitude to our Dear Lord for so much blessings that we are receiving. You're the best! Again, Thank you so much Sweet Baby Diapers! I love you so much Baby Queen! wow! blessing talaga. ang laki ng natipid.